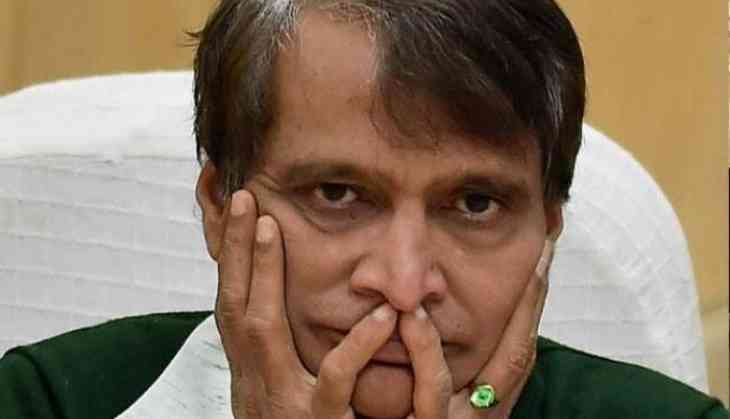 Amidst Opposition's demand for his stepping down from the position of Union Railway Minister over derailment of the Puri-Haridwar Kalinga Utkal Express, Suresh Prabhu on Wednesday informed that though he takes moral responsibility of the incident, Prime Minister Narendra Modi asked him to wait. Prabhu took to his Twitter handle to post a thread, where he says, "In less than three years as Minister, I have devoted my blood and sweat for the betterment of the Railways. Under the leadership of Prime Minister Narendra Modi, I tried to overcome decades of neglect through systemic reforms in all areas, leading to unprecedented investment and milestones." "New India, envisioned by Prime Minister Modi, deserves Railways, which is efficient and modern. I promise that is the path on which Railways is progressing now," he further said. Adding, "I am extremely pained by the unfortunate accidents, injuries to the passengers and loss of precious lives. It has caused me deep anguish. I met Hon'ble Prime Minister Narendra Modi, taking full moral responsibility. He has asked me to wait." The Congress on Monday demanded Railway Minister Suresh Prabhu's resignation after the derailment of the Puri-Haridwar Kalinga Utkal Express, which claimed the lives of 23 people and left more than 100 injured, at Muzaffarnagar's Khatauli region on August 19 evening. In a press conference held here, the Congress cited previous examples of ministers, who resigned after such tragedies and asked Prabhu to do the same. "When a similar incident happened four decades ago, the then Railway Minister stepped down. When a flight crash landed in Delhi, the former civil aviation minister Late Madhavrao Scindia resigned. The government should take moral responsibility for the accident," Congress leader Manish Tiwari said. He added that the incident points to gross negligence on the part of the government. "On 11th June, the villagers stopped a train going towards that direction as repair work was being done. Two months later, an accident happens in the same place. This is unacceptable," Tiwari said. Earlier, the Congress said that the railways accident has become the continuing story in the last three years of National Democratic Alliance (NDA) government. "We are not at all satisfied. In last three years of this NDA Government, 27 major accidents took place including this one. No single accident was investigated properly. Today, the railways accident is the continuing story. Let this minister and the government think whether they should take moral responsibility or not," Congress leader PC Chako told ANI. Another grand old party leader Brijesh Kalappa said that the Bharatiya Janata Party (BJP) knows how to blame the Opposition, instead of accepting theirown mistakes. "Who will take the responsibility of this tragic accident in Muzaffarnagar? In Modi government, there is no one to take the responsibility. They only know to how to blame the Opposition, to demand resignations from others instead of giving on their own mistakes," Kalappa said.